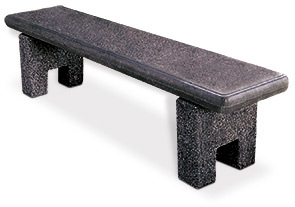 The unique craftsmanship of this concrete flat bench has a timeless presence. Rest comfortably on the smooth finish of the ground and polished bench seat. The block legs seamlessly connect to the seat, creating distinct subtle character to the bench. Entirely constructed from reinforced precast concrete this 6' flat bench is ready to sustain the stresses of persistent public use and weather exposure. These flat benches are ideal for parks, gardens and outdoor spaces due to their inherent durability plus vandal resistance.